Dwight Melton scored a 189.6 percent gain with his selection of Southwestern Energy. 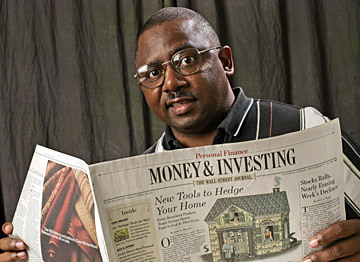 The stock market may be having a flat year, but don't try telling Dwight Melton that 2005 is a bust. His hypothetical $20,000 portfolio was up an astounding 56.2 percent to $31,232.59 during the first three quarters of 2005. Not too shabby when you consider the three major indexes had total returns of between 2.8 percent and minus 0.6 percent during that same period. It won't be long, though, before the overall market takes a turn for the better, said Melton, one of three local stock experts participating in the Star-Bulletin's annual survey of best investment ideas. "The stock market is proving to be quite resilient, shaking off most negative news, including the recent rise in oil prices, Hurricane Katrina and Rita, and the unsettled global situation," Melton said. "This tendency to continue coming back in the face of troubling news makes me optimistic regarding the market's ability to move to new high ground once the news background turns favorable." Melton, co-founder of the Hawaii Stock and Options Group investment club, turned the contest into a one-man race even though his competitors also beat the major indexes and turned in positive gains through three quarters. 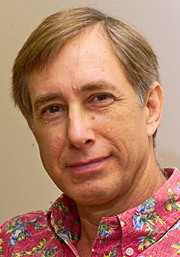 Financial adviser Barry Hyman, a vice president in charge of the Maui branch for Michigan-based FIM Group Ltd., was up 13.5 percent to $22,694.17. And Richard Dole, chief executive officer of investment banker Dole Capital LLC, saw his portfolio increase 5.8 percent to $21,163.78. Melton, who jumped into energy stocks at the beginning of the year, can thank Southwestern Energy's 189.6 percent gain for a large part of his portfolio's performance. The Houston-based natural-gas distributor and producer headed up a five-stock portfolio that also included a 66.5 percent gain from Apple Computer Inc.
Cal Dive International Inc., a Houston-based construction and salvage company for the oil industry, posted a 40 percent jump even though Melton didn't add the stock to his portfolio until the beginning of the second quarter. Under contest rules, stock pickers are allowed to change their selections each quarter. Although Melton said he believes oil stocks have a little further to run this year, he expects oil to stabilize in the next few months. "Should this optimism not prove to be true, the price of many items that depend on this key commodity could rise sufficiently to raise the level of inflation and hamper GDP growth next year," Melton said. Hyman, the most conservative of the three stock pickers, said if the market were a rational entity then stocks should be lower than they are right now. "Stocks are still priced for perfection and, with all of the obstacles in the way, I think the likelihood of economic and corporate perfection is pretty darn low ... However, markets are anything but rational in the short term. Trying to predict the direction, yet alone the level, of markets or interest rates three months or even 12 months down the road is futile." Hyman's top pick, Vestas Wind Systems A/S, soared 43.3 percent in the third quarter alone after Hyman reduced his holdings to 185 shares from 260. Denmark-based Vestas, the world's largest windmill maker, gained 31.6 percent during the first half of the year when Hyman had the larger stake. He also scored big with Scudder Global Commodities Stock Fund, a management investment company that invests at least 80 percent of its total assets in equity and commodities-linked securities of commodities-related companies. Scudder gained 21.2 percent during the first nine months of the year. 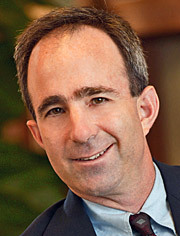 As an example of Hyman's cautiousness, he had more than 36 percent of his portfolio at the end of last quarter invested in Western Asset/Claymore U.S. Treasury Inflation Protected Securities Fund 2, a management investment company that invests at least 80 percent of its total managed assets in U.S. Treasury Inflation Protected Securities. He increased his stake in the company to 639 shares from 555 shares at the start of the third quarter but lost 1.8 percent during those three months after having gained 2 percent during the first half of the year with his original amount of shares. Dole, who each year in the contest selects at least one Hawaii company, is picking up Alexander & Baldwin Inc. in the fourth quarter and dropping Central Pacific Financial Corp. Dole, who has owned A&B is previous years' contests, said he can't ignore A&B's new development prospects in Kakaako that is in addition to the company's "already robust real estate development outlook." "I note that A&B has a lower cost of capital than most developers," Dole said. "Meanwhile, Hawaii's economy has sufficient strength to support its shipping business. I think A&B has more near-term price potential than Central Pacific." Central Pacific fell 1.2 percent during the first three quarters this year while A&B had a total return, including dividends, of 27.4 percent during the same period. "Despite its board's reluctance to boost its dividend, in the event the stock continues to do well in the market, its board may consider a stock split, coupled with a higher dividend," Dole said. A&B, which closed yesterday at $46.48, has maintained its dividend at 22.5 cents -- representing a current yield of about 2 percent -- for the last 31 quarters. A&B is scheduled to announce its third quarter earnings and fourth-quarter dividend later this week. Dole had two double-digit percentage gainers through the first three quarters led by Companhia Vale do Rio Doce, the world's largest iron-ore producer, which gained 53.6 percent. Defense contractor Lockheed Martin rose 11.2 percent. 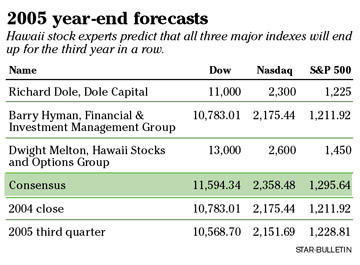 Like Hyman, Dole is somewhat pessimistic about the market's near-term future. 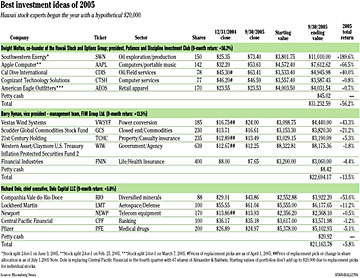 "Taking from Merrill Lynch, we are in the worst spot for equities right now," he said. "The Fed is tightening while profit growth is decelerating. The best places to be right now are energy -- while at some point investors will start taking profits -- health care, and consumer staples. Accordingly, I believe that the market in general will remain relatively flat or weaken."